Yesterday morning, in a broad sun-lit corridor inside the Pentagon building just outside Washington, D.C., the past and the present met… and breathed a deep sigh of appreciation and satisfaction. The Legal Genealogist and several family members were being treated to a tour of the control hub of American’s military might by a friend and fellow genealogist, a retired military officer who is now a senior civilian at the Department of Defense. We had seen the views from the various entrances, and the stunningly simple and moving tribute to all those who died in the attack on the Pentagon on September 11, 2001. We had spoken in hushed tones in the solemn room set aside to honor those few exceedingly brave individuals who have won this nation’s highest honor for valor, the Medal of Honor, and in more hushed tones in the room set aside to honor those killed in the 9/11 attack. We’d seen the food court and the shopping mall and considered the wisdom of turning the ramp to the Metro into a water slide. And then… and then… there was that corridor. It honors those who went to war for the United States and who didn’t come home… or didn’t come home as an individual with a name. Those that circumstances left behind. Those that scientific methods could not put a name to. Those who — today — are coming home, with identities intact. And for that, we can thank this trio of DNA, the military, and genealogy, the end results of which are showcased and displayed in that corridor. Because now, in this 21st century, DNA from living family members can be compared to the DNA extracted from those fragments previously recovered and still being found on battlefields and ricefields and the jungles of previous wars. But to be able to use DNA effectively in this task, somebody has to find living family members whose DNA can be used for comparison. This isn’t as easy a task as it might seem — and that’s where the genealogists come in. So who can you test for remains you suspect to be those of service member like these, who still need to be identified and brought home? It can’t be the serviceman’s children: they would have their mother’s mtDNA, not the mtDNA of their father. For the same reason, it can’t be the children of a brother of the serviceman: they too would have their mother’s mtDNA, not the mtDNA their own father shared with the serviceman. No, the people who need to be located are those few in any family tree who have an unbroken female line of descent from a common female ancestor of the serviceman. A brother or sister would work perfectly — except for the cases where there were no siblings or where all the siblings have died. The search then goes on to children of sisters or grandchildren of sisters whose mothers were the serviceman’s nieces. And if no-one can be found in those categories, the search goes back to the serviceman’s mother’s sisters and their female descendants. And then to the serviceman’s mother’s mother’s sisters and their female descendants, and so forth. It’s a task that genealogists are uniquely suited to… and a task our community has risen to in a big way. People like Catherine Becker Wiest Desmarais, CG, in Vermont. Megan Smolenyak Smolenyak in New Jersey. Dee Dee King, CG, in Texas. And so many more. So if anyone ever asks you… what good is genealogy anyway? Think about that sun-filled corridor in the Pentagon — and the soldiers, sailors and airmen coming home with names and faces and identities. If anyone ever asks you… why would any genealogists ever need immediate access to the Social Security Death Index? Think about that sun-filled corridor in the Pentagon — and the fact that putting names and faces and identities to those remains requires finding people alive to test today in groups that dwindle with every passing day and every family death. And if anyone ever asks you… what good is DNA anyway? Think about every single image of every single face displayed in that Pentagon corridor, of every family that has been able to say welcome home to a loved one, to put an end to the “what happened to…” questions, to have closure, to begin the healing. 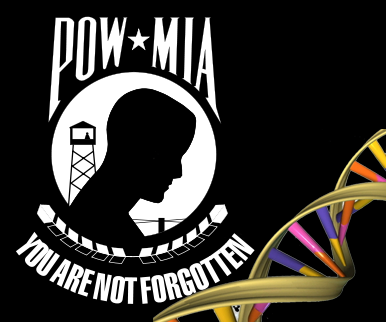 DNA, the military, and genealogy. A meeting place we can be proud of. Just a point to update. When I started working with Navy in 2009, yDNA had been recently added to mtDNA as a source. The military repatriation labs have been world leaders in developing new and better techniques, or improving upon those discovered by others. The labs have added autosomal DNA to the mix. However, I’ve been told that mtDNA remains the most reliable, especially in cases of very old remains in bad conditions. Thanks, Judy, for this nice post! (a) Thank YOU for the work you do. (b) It does read as though I meant mtDNA was the only type used — what I intended to convey was that it’s the most commonly used type particularly for older cases. Thanks for the clarification. Thanks for the post Judy. As a Marine (albeit an ancient one) and a home genealogy buff, I appreciate the topic. Hope to see you again at this years SCGS Jamboree. Thanks, Chris, and yes — I will be at Jamboree again this year. This is the best thing I’ve read today. Thank you for this perspective. Very well written. I’m definitely sharing this. Thanks for the kind words, Brian. A moving explanation of what we military repatriation case workers do! Thank you, Judy! No, thank YOU, and all of our community who do this work. Thank you from the bottom of all of ours hearts. Magnificent post!!! The goosebumps have not subsided. What a wonderful service these genealogists provide! I can’t imagine more rewarding work. I can’t imagine it either, Diane, and can’t imagine doing it. I would be in tears 24/7 doing this sort of thing. Thank you so much for this wonderful, thought-provoking post. And also, thanky you, thank you, thank you, to all the wonderful and generous people who are working tirelessly to bring our loved ones home and helping to fill the holes of loss in our hearts. Blessings to all. There are a LOT of genealogists who have done and are doing very good work in this area, Louise. I can’t begin to name them all — those I mentioned, my friends and colleagues Polly Fitzgerald Kimmitt, CG, Diane L. Giannini, CG, the whole team at the American History Company led by Therese Fisher, AG — I could go on all day and probably still leave people out. Thank heavens for all the folks who do this.